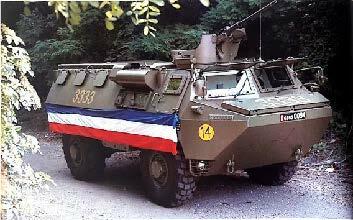 Twelve years after the placing of an order for 4000 VAB armoured personnel carriers by the French army, the production line roll-off of the 3333rd vehicle occasioned a special ceremony of the type normally reserved for the aviation industry. As the 3333rd VAB came off the production line, a special ceremony was organised in cooperation with the French Army. This was to witness the delivery of its 2464th VAB, the other 869 armoured personnel carriers having been sold for export, proof of its success. At the time, it represented 47% of the world's wheeled armoured vehicles in the 12/15 tonne category (excluding Warsaw Pact vehicles). The decision to build it in partnership with Creusot Loire in Saint Chamond required the construction of a new 14,000 m2 production hall located on the site of the former foundry. It was finally shut down in 1993, when the total number of vehicles delivered to the French Army was 3975, with a total of about 1000 exports, primarily to Morocco and the Middle East.